Modularity is an ongoing focus in genetic programming research. Enhanced modularity can accelerate solution convergence and increase human understanding and knowledge gained from evolved programs. Prior advances in modularity research have addressed programming language elements such as functions, modules, and recursion. This paper proposes improving modularity by considering non-language elements, specifically software design patterns. A new genetic programming technique implementing the template method pattern is described. This technique was tested and compared to existing genetic programming approaches in the prediction of nonlinear time series subject to abrupt changes in the underlying data generation process. Such series are often seen in areas such as finance and meteorology and have proved challenging for genetic programming to model and predict. Experimental results demonstrate the potential for incorporating additional software design patterns into genetic programming and applying these techniques to additional problem domains. Table 13 lists the random parameters used in the creation of the MGHENMG series. 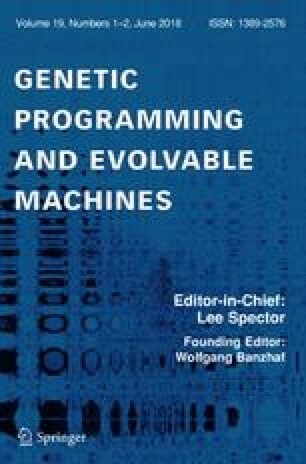 The full data sets, executable binaries, and parameter files from the experiments described in this report are available at http://www.infoblazer.com/geneticprogramming. Source code is also provided in a GitHub repository.